Greater Lansing Area Clean Cities (GLACC) is working with several other coalitions to develop an Alternative Fuels Coordinator along I-94. The M2M project covers a 1500-mile span of I-94 – from Port Huron, Michigan, to Billings, Montana – to develop and enhance infrastructure and fueling sites to accommodate alternative fuel vehicles, such as electric and compressed natural gas vehicles. Interstate 94 (I-94) is the northernmost east–west Interstate highway connecting the Great Lakes and Intermountain regions of the U.S. This international trade corridor originates in Port Huron, Michigan at the U.S. border with Canada at Sarnia, Ontario. I-94’s western terminus is in Billings, Montana, at a junction with I-90. I-94 is the only east–west Interstate highway to form a direct connection into Canada connecting points from Seattle via I-90 to Toronto via Ontario Highway 401. 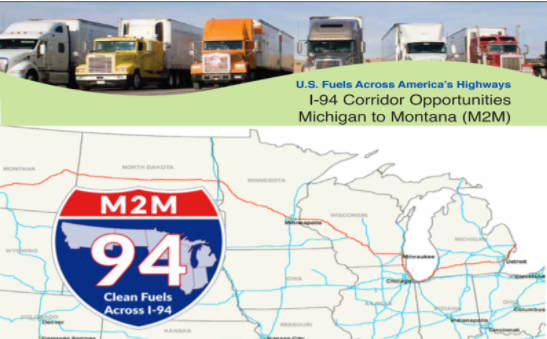 Why this corridor: While I-94 is a major Interstate highway connecting the Great Lakes and Intermountain regions of the United States there are several gaps in alternative fueling infrastructure between Michigan and Montana. The M2M project is being facilitated by Clean Cities Coalitions within the U.S. Department of Energy’s Clean Cities network along this route to give public and private fleets and individual drivers more options to fuel with cleaner alternatives such as electricity, compressed natural gas (CNG), and propane Autogas.